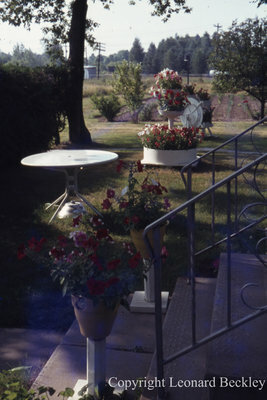 A colour slide of cement stairs with flower pots on either side at Leonard Beckley's residence. In this view the Port Whitby, Port Perry, Lindsay (Nip 'n Tuck) railway can be seen in the distance. The railway line is no longer in use and portions of the track have been removed. Leonard Beckley's Garden, June 1978, Leonard Beckley. Whitby Archives A2014_004_254.